Welcome to Java Bay, a 5-bedroom villa nestled overlooking the glistening Caribbean Sea on the West Coast of St James, Barbados. Based in a gated community in Calijanda Estate, this villa is perfect for your secluded getaway. The Villa features some of the most exquisite panoramic sea views across the mesmerizing waters. The villa can accommodate up to nine guests across its luxurious bedrooms, spacious living areas, and large exteriors. Situated on a 3/4-acre ridge plot, the villa enjoys 180-degree sea views. Villa Java Bay was recently renovated and is built following a unique Indonesian inspired design. The rooms embrace an open plan concept for luxury living with all the comforts of a modern home. The property blends the indoor and outdoor living spaces seamlessly creating a natural island-style experience. 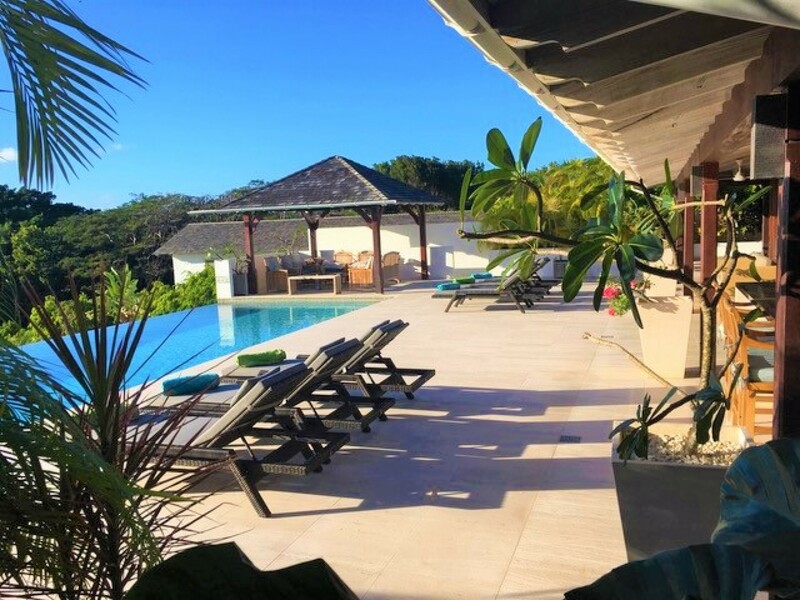 Villa Java Bay has been finished to an excellent standard using the highest quality materials, with features such as coral rendering, Portuguese limestone floors downstairs and Burmese teak floors in the upstairs bedrooms. The custom-made Indonesian furnishings and handmade carvings from Bali also reflect the high quality provided by this villa. The villa is surrounded by lush tropical landscapes and vivacious vegetation. The Incredible sea views can be enjoyed from various bedrooms as well as the large outdoor terrace. The large infinity edge pool is perfect to slip into in the morning for a refreshing swim. You can dry off and warm up on the comfortable sun loungers. You can read a book is the secluded shade of the private Gazebo or the various outdoor seating areas in this serene location. Listen as the breeze rustled through the tall palm trees as you let your worries float away and you relax in your tropical home. Enjoy an evening meal on the covered dining area and spark up the Barbeque for some smoky offcuts and tantalizing treats to indulge in. Watch from the comfort of your lavish living room as the sun sets in the distance and the sky burst with colors and then fades uncovering the bright stars. The attention to detail is incredible as the villa delivers an unparalleled quality for you to enjoy. As you walk into the villa you will be greeted by the soft sounds of trickling water from the decorative water feature. Making your way into the spacious open plan dining area, living area and kitchen you will notice the large wooden vaulted ceilings, ornate artwork on the walls and the smooth crisp tiles. The room is fitted with plush seating and opens out onto the large terrace. The room is flooded with light due to the blend of interiors and exteriors and so the breezes can float easily through your home. The Kitchen comes fully equipped and ready for you to use if you wish. Otherwise, you can arrange for your own professional chef to cater to your meals as you relax here in your island style villa. 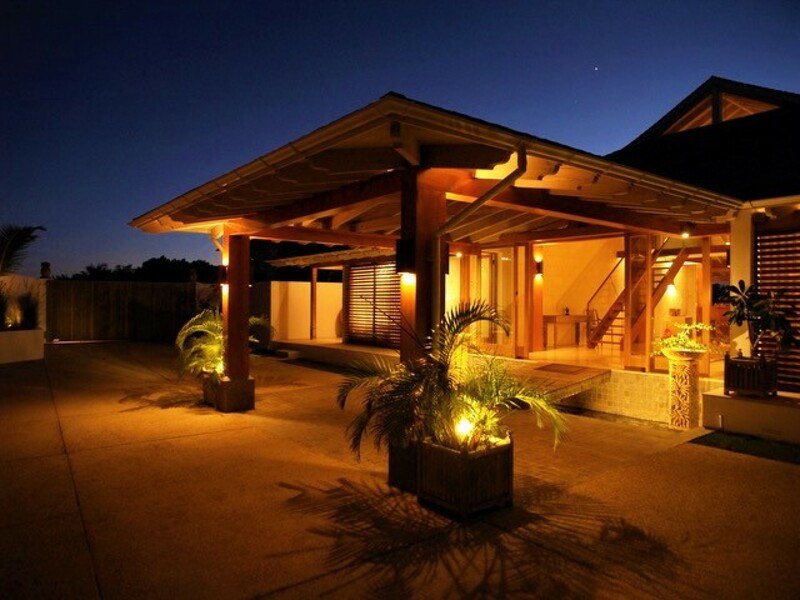 The villa includes air-conditioning and secure Wi-Fi. On the ground floor, you will discover three of the luxurious bedrooms. Both rooms have private en-suite bathrooms as well as air-conditioning. 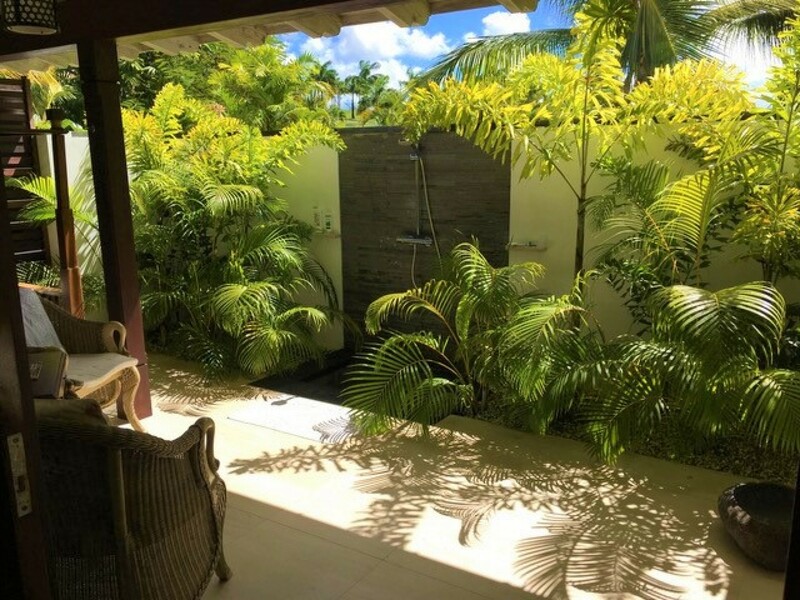 The first bedroom is the master bedroom that features an outdoor courtyard bathroom with a huge oval two-seater bathtub that, through a specially cut opening in the wall, allows you to indulge in the ocean views and still enjoy the privacy that is provided by the high walls. The second bedroom is a large comfortable Twin/Double room. There is also a third single, an air-conditioned bedroom which is perfect for a child or nanny. The first floor is accessed by a majestic mahogany/glass staircase. Here, you will find a further two double bedrooms that are air-conditioned and have en-suite bathrooms. These bedrooms can also be made up as twin beds if desired (arranged in advance). The rooms enjoy sea views from the cleverly designed windows. 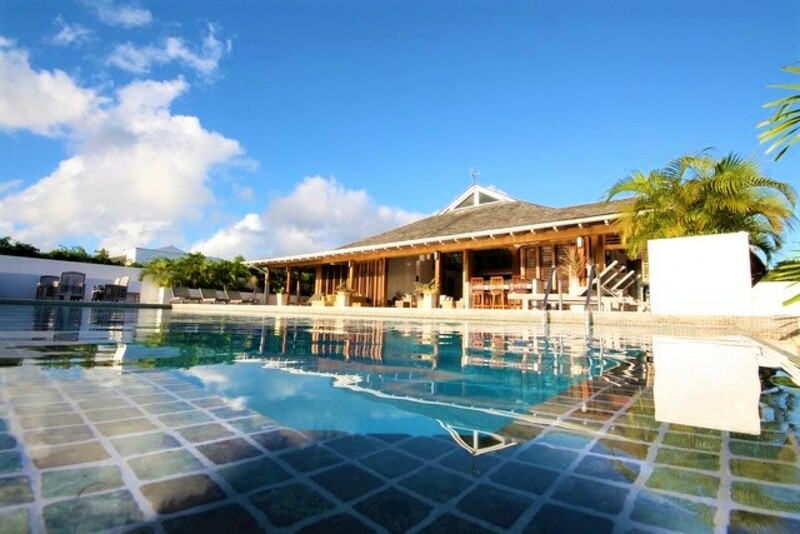 Java Bay Villa is nestled overlooking the glistening Sea Views on the West Coast of St James, Barbados. Based in a gated community in Calijanda Estate, this villa is perfect for your secluded getaway. The Villa features some of the most exquisite panoramic sea views that span out across the mesmerizing waters of the Caribbean Sea. Grantley Adams International Airport is a 40-minute drive from the villa based at 30km in distance. Barbados is a vibrant coral island that is nestled in the tranquil waters of the Caribbean Sea. On the West Coast, where Java Bay is located, you will find an abundance of beaches that stretch along a crystalized blue-green sea. Coral reefs fringe the coast and provide you with some of the best snorkeling and Scuba Diving locations. The trade winds provide the land with a refreshing breeze giving it a mild and pleasant tropical climate. Saint James is famous for its high-end resorts that are dotted along the Seas coastline. St. James has a range of excellent fine dining restaurants, several golf courses, shopping outlets and exclusive soft sandy beaches including calm Payne’s Bay and Sandy Lane. It is home to the Apes Hill Golf Course, a top-class course laced with ravines, wooded areas as well as natural and man-made lakes. This is the perfect location for you to spend a day playing a leisurely game of golf with your friends. Chattel Village is located on the West Coast and the "Village" provides you with a profusion of vibrant places to explore. There are souvenir stores, bath and body items, art pieces, beachwear, and exotic boutiques. Java Bay is also a short 5 minutes’ drive from Holetown. The first English settlers in Barbados landed at Holetown in 1627. The town has exclusive shops and a vibrant little nightlife located near the beach. There are also several luxurious and delicious beachfront restaurants in Holetown including ‘Tides’, ‘Zaccios’, ‘Surfside’ and ‘The Beach House’. Bedroom 1 Master Suite Luxurious Double Bed, Private en-suite bathroom, Air-conditioning, Ceiling Fan. Bedroom 2 Comfortable Twin/Double room, Private en-suite bathroom, Air-conditioning, Ceiling Fan. Bedroom 3 Luxurious King-sized Bed, Private en-suite bathroom, Standalone Shower, Air-conditioning, Ceiling Fan. Bedroom 4 Comfortable Twin/Double room, Private en-suite bathroom, Standalone Shower, Air-conditioning, Ceiling Fan. Bedroom 5 Comfortable Single Bed, Private en-suite bathroom, Standalone Shower, Air-conditioning, Ceiling Fan.